This last weekend I went to Califaux, my first large, out-of-town Malifaux tournament and I had an absolute blast! This post is a short recap of my experience there (and a bit of a photo-dump). It’s been awhile since I’ve posted photos of any finished miniatures other than my Iron Painter entries, but with the week between the end of round 4 of Iron painter and the start of the final round I managed to get a bit of work done on some other models. 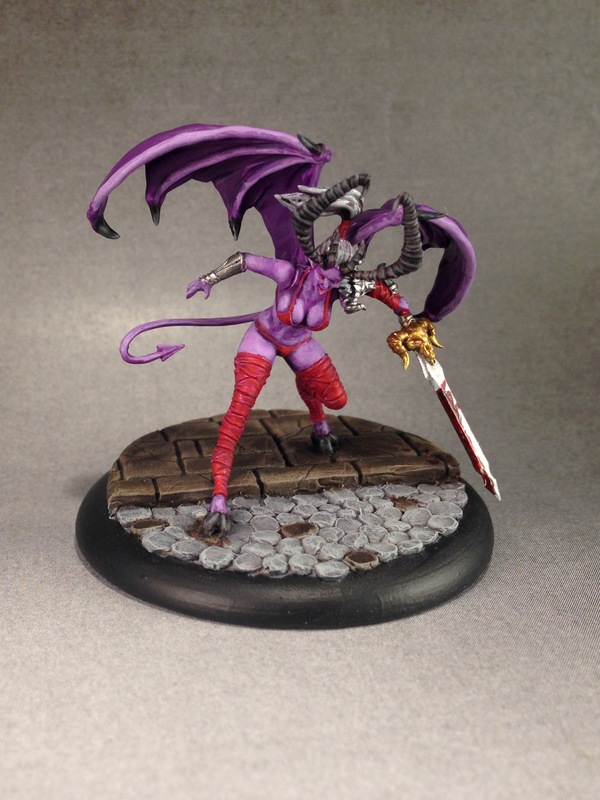 This here is Nekima from Malifaux; looking at her it’s pretty easy to figure out what she’s all about. I hope you like her! An old maxim exists amongst miniature gamers that if you are waiting for the plastic version of a miniature to come out, it won’t come out until you finish painting the metal version of it. To everyone who has been waiting for Wyrd to come out with the plastic Stitched Together kit, you’re welcome–Wyrd just announced the release date for these creepy bags of guts in their latest newsletter. Many philosophers over the years have posited answers to the immortal question, “Who let the dogs out?” I am here to tell you that it was, in fact, Marcus who let the dogs out. Marcus has released these Guild Hounds from their enslavement by the corrupt Guild and welcomed them to the freedom that comes with membership in Marcus’ Magnificent Menagerie; they shall henceforth be known as Arcanist Hounds! I’ve had quite the productive week, so I have a fair amount to show you for Work in Progress Wednesday this week (although only had time to snap the one picture). If you checked here earlier this week I showed off the Slate Ridge Mauler I finished up and I have my Guild Arcanist Hounds finished to a point where they are very nearly finished, so I won’t be showing you any more of them until the finished reveal. Other than those projects, I got quite a bit done on a few other projects. As I have been loving running dogs with Marcus, I have decided that my Canine Remains will be the next Malifaux models I will finish off after the Guild Arcanist Hounds; I just started in on the details for them. The Sigismund model I am painting on commission for a friend is coming along nicely. It is honestly an intimidatingly detailed model that I really don’t want to mess up, but I feel like I have finally gotten over the hump on that one and am making some great progress on all the little details that make is such a cool model. 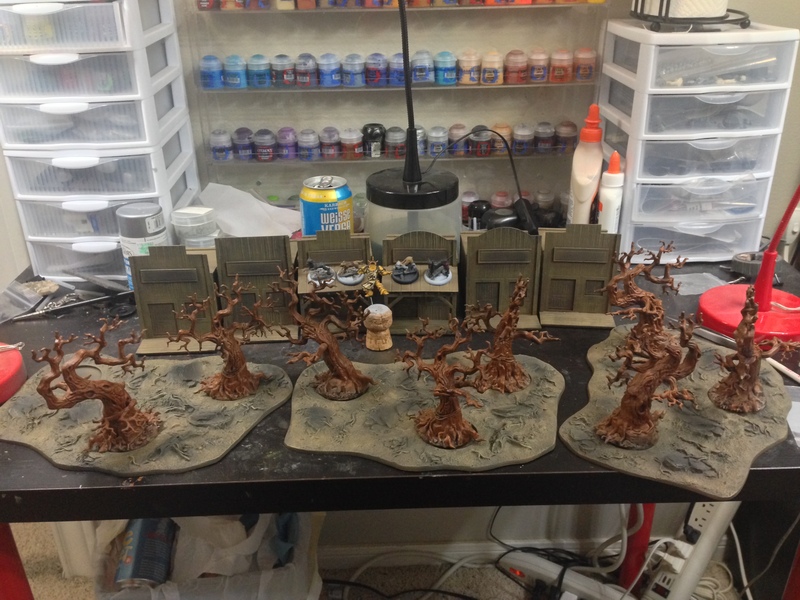 On the terrain front I have basecoating and initial highlights done on the main portions of the buildings, trees, and forest floors I’m working on, so it’s time to move on to the details. I also obtained a nail polish rack this week to store/organize my paints and clear up some work space on my hobby desk and I love how much easier it is to find the paint I need and then keep my desk from being cluttered by leaving too many paints sitting out instead of putting them back into the drawers I previously stored them in; I also started transferring my GW paints over to dropper bottles to extend their lives and to make mixing/thinning paints more efficient. Something else that I am ridiculously excited about is the Kickstarter for “Corrupted Kingdoms” from Artana games which launched today. I wanted to share this Kickstarter with you all since I thought it would interest most anyone who’s interested in this blog. I am in no way involved with this Kickstarter other than backing it and really hoping it funds. I’ve been waiting for this to launch since I demoed it back in August during day 2 of Gen Con; it was one of my favorite games I tried out there. Go check it out and back it, you won’t be disappointed!